This product is prepared by labeling highly cross-adsorbed donkey anti-mouse IgG (H+L) with a selection of our bright and photostable CF® dyes and other labels. To minimize cross-reactivity, the antibody has been adsorbed against bovine, chicken, goat, guinea pig, Syrian hamster, horse, human, rabbit, and sheep serum. 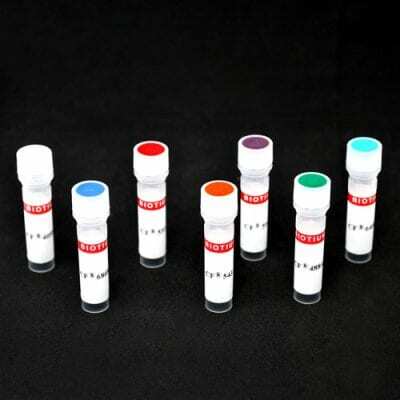 This product is prepared by labeling highly cross-adsorbed donkey anti-mouse IgG (H+L) with a selection of fluorescent CF® dyes and other labels. To minimize cross-reactivity, the antibody has been adsorbed against bovine, chicken, goat, guinea pig, Syrian hamster, horse, human, rabbit, and sheep serum. This antibody is not cross-adsorbed against rat. For staining rat tissue, or co-staining with rat antibodies, we recommend using Goat Anti-Mouse IgG (H+L), Highly Cross-Adsorbed (Min x Rat). Note: Conjugates of blue fluorescent dyes like CF®350 are not recommended for detecting low abundance targets, because blue dyes have lower fluorescence and can give higher non-specific background than other dye colors.